I have been making harpsichords for over thirty-five years, starting in Boston at the Hubbard harpsichord workshop, where I learned woodworking in the kit shop and voicing and finishing in the custom shop. I later went to work for Eric Herz in Cambridge, where I did cabinetry in his harpsichord shop. 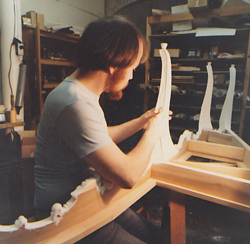 In 1986 I moved to Indianapolis, where I worked as head cabinetmaker and case designer at Goulding and Wood Pipe Organ Co. Even though employed by others all these years, I have still managed to make harpsichords in my own workshop. Having a one-man operation affords me creative and quality control throughout the entire project start to finish. I do everything from choosing the wood and other materials, designing, building, painting, and finally voicing the completed instrument. Soundboard decorating, however, is subcontracted to expert painters. I can also do carved and gilt stands and benches for my instruments as well as for other existing harpsichords. I take time to make sure everything is done to the customer’s satisfaction and my own as well. I take pride in my experience and training and in my continuing work, and I am gratified by my customers’ praise and satisfaction with my work.